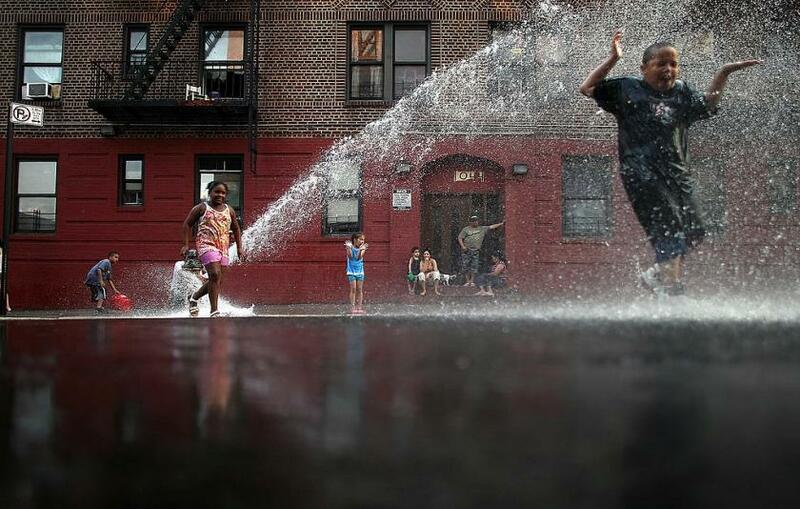 New York City summers bring to mind images of children running through open fire hydrants, free concerts in the park, and a feeling of carefreeness not associated with any other season. If the results of new research are correct, New York City summers could conjure darker images as the result of worsening climate change..
It’s well-known that high temperatures can overheat the body and lead to heat exhaust or even heat stroke. Researchers from Columbia University wanted to see what effect rising temperatures would have on the mortality of New York City’s residents. Using data from 33 global climate models and two scenarios showing greenhouse gas concentrations, they predict as many as 3,331 people could die every year from heat exposure during New York City summers. The research accounts for future population size, greenhouse gas emission trajectories, and things like air conditioning and public cooling centers designed to help people adapt to the heat,,. Columbia University researchers predict that as many as 3,331 people could die every year from heat exposure during summers in New York City. Now, with the looming threat of climate change, scientists at Columbia University have estimated future heat-related deaths in New York City using data from 33 global climate models and two scenarios showing g reenhouse gas concentration rather than emissions.. e“We were surprised by the wide range of potential public health impacts depending on the specific combination of climate, adaptation and demographic scenarios,” first author Elisaveta Petkova told Medical Daily. She added that the projected number of annual heat-related deaths across the models used, adaptation and population change ranged from 167 to 3,331 in the 2080s compared to 638 heat-related deaths annually between 2000 and 2006. However, there are two ways to limit the number of heat-related deaths from climate change: One is to reduce fossil fuel emissions; another is to offer more ways for people to adapt to the heat through interventions such as public cooling centers. Researchers project that a reduction in fossil fuel emissions -- if the climate adheres to the more moderate of two greenhouse gas trajectories - can result in nearly 2,000 fewer annual heat-related deaths. High levels of adaptation could also save an additional 1,198 lives. “These findings highlighted the role of the various assumptions we made in our models and illustrated the importance of taking of proactive measures to reduce greenhouse gas emissions and implementing various city-level measures to reduce heat vulnerability (such as education about heat-related health impacts, as well as cooling centers and emergency “heatlines” [such as 311 during heatwaves],” Petkova said. Climate change has been linked to many health risks, including disease outbreaks. For example, two years ago the U.S, along with the Caribbean Islands and Latin America experienced a chikungunya outbreak -- a mosquito-born virus that is usually found thousands of miles away in Africa and Asia. The World Health Organization attributed more than 1.3 million suspected cases and 191 deaths to Chikungunya, “a virus that had no business even being in the Western part of the world,” Medical Daily previously reported. Although it isn’t clear whether or not global warming was the direct cause of the outbreak, scientists believe rising temperatures helped it spread faster. It’s important to note that air conditioning, is already pervasive in New York City and that adaptation efforts in general are at or close to being maxxed out. However, they suggests other ways New York City could become more resilient to heat, such as through the installation of reflective roofs and green infrastructure including tree planting. Source: Petkova E, Vink J, Horton R, et al. Towards More Comprehensive Projections of Urban Heat-related Mortality: Estimates for New York City under Multiple Population, Adaptation, and Climate Scenarios . Environmental Health Perspectives. 2016.